Derek Kenny is Register of Gas Installers of Ireland (RGII) certified and offers a 24-hour emergency plumbing & heating callout. As a registered gas boiler service company, we provide a certificate of conformance with every boiler service, with a 16 point safety check. Buying a new boiler is a big investment for a household - so we have partnered with Flexi-Fi Finance. Apply here: Make an Application for Boiler Finance or see our Finance Offer for more information. 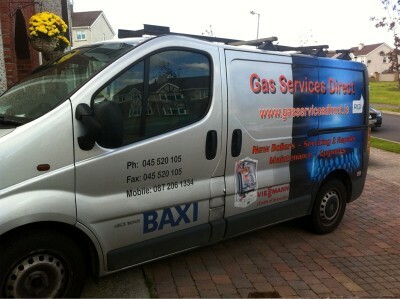 Derek Kenny of Gas Services Direct has been in business for over 16 years performing efficient and reliable boiler servicing and repairs throughout Counties Kildare, Laois, Dublin and surrounding areas. Saturday and evening calls available. Carbon monoxide alarms supplied for 20e with every boiler service. All gas boiler manufacturers and Sustainable Energy Authority of Ireland (SEAI) recommend an annual boiler service to insure your boiler is safe and efficient. Contact us today to arrange your boiler service and all your gas boiler installation or repair requirements.